Mining firm Randgold Resources says it is to begin mining Africa's largest undeveloped gold deposit - in eastern DR Congo. The mine will require the re-location of 15,000 people, but Randgold says the project has the support of the government and the local community. The mine is thought to have a reserve of about 320 tonnes of gold, it says. It is as big as any of the current mines in South Africa, one of the world's biggest gold producers. The Democratic Republic of Congo has massive mineral resources but most of its people live in poverty. The battle to control mines has been a major factor in the conflict which has raged in eastern DR Congo for at least 16 years. Randgold, listed on the London Stock Exchange, says it will begin developing the mine from the middle of 2011. 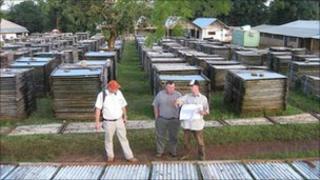 The Kibali gold project is located in a remote corner of DR Congo, close to the Ugandan border. To develop it, Randgold has had to build a 180km (112-mile) road eastwards to Uganda. Randgold chief executive Mark Bristow said the site will be secure. "We have been operating here for nine months now. This is not connected with the eastern part of the Congo. "This area has not had a history of conflict. We don't arm people... The state provides security. There is the police and the army, which is working with the Ugandans against the LRA in an area north of here." Randgold says it has won community support, despite the fact that 15,000 people will have to be moved, as well as a Catholic church and a cemetery. Mr Bristow said the villagers lived in "very poor, poor conditions" and would be moved to a new village constructed by the company. Foreign "gold washers" at the site had also been moved away from the company's permit area as they were illegal, he said.